Apache Ghost dance. Ceremonial head gear. Home » Apache Ghost dance. Ceremonial head gear. Apache Ghost dance. First Nations ceremonial head gear. Annual Ethnology Report of the US Government. Lithographed by Sackett & Wilhelms. Printed in New York: c.1897. 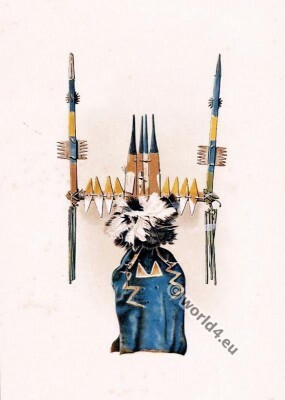 This entry was posted in 19th Century, Accessoires, Ecclesiastical, Headdresses, Native American, North America and tagged Ecclesiastical Dress, Native american dress on 1/4/15 by world4.